It’s too late to get yourself a new house designed by Louis I. Kahn, but how about a drawing? About 60 are on view at Lori Bookstein Fine Art. There are mountain ridges, fishing huts on the Amalfi Coast, New England churches and Egyptian granite quarries. Executed with a sure hand, the works examine how man-made structures interact with space and nature. The early pieces are influenced by Kahn’s Beaux Arts training. A 1927 pencil drawing of a castle tower in England is so perfectly detailed it looks like a black-and-white photograph. Later works get more abstract. “Cliff Road, No. 3, Cape Breton Island, Nova Scotia, Canada” conveys the space with only a handful of lines. 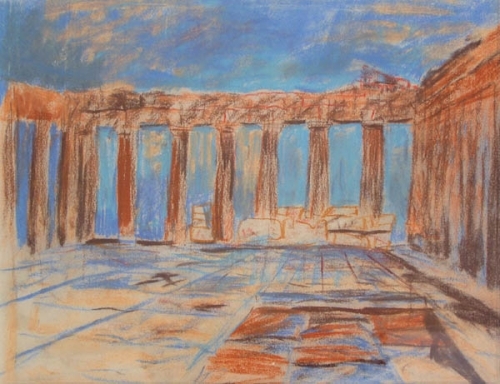 The best may be several terrific pastels from the year Kahn spent as a resident at the American Academy in Rome.